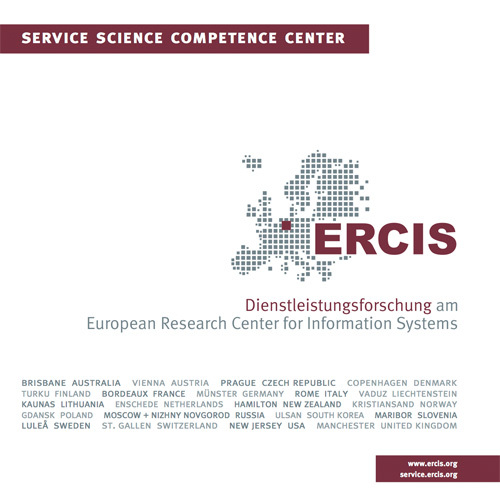 CrowdStrom | ERCIS Competence Center "Service Science"
Electric mobility demands a new transportation infrastructure based on a comprehensive network of charging stations. The demand for electric vehicles is hampered due to the limited range of the cars and an incomplete coverage with charging stations. On the other side, as investment costs for comprehensive networks are immense, supply companies require a high demand generated by large numbers of potential customers. In this context, "CrowdStrom" aims at reutilizing existing supply systems in order to provide a solution for the initial “chicken-and-egg problem“ of the supply and demand in the eCar market. The CrowdStroms project's goal is the development of an innovative service, encouraging private people to set up charging stations and granting access to third parties. This crowd-sourced concept faces the challenges to develop new, standardized processes covering the entire range of requirements for setting up and operating a charging infrastructure for electric vehicles. The project's analysis on customers' willingness to pay enables the creation of an incentive system. Additionally, the CrowdStrom-project includes a detailed analysis of legal difficulties, occuring as customers become suppliers. The implementation of a software-system managing the service processes and the flow of information between participating parties will provide the technical foundation for the concept. Operating this system and the integration of all partial services set up an innovative business for supply and infrastructure providing companies, resulting in a public charging network empowered by existing private charging stations. The CrowdStrom project is kindly supported by German Ministry of Education and Research (promotion sign: 01FE13019). More information is available at: http://www.crowdstrom.de.